A galaxy without Dark Matter? Dark matter is a a slippery substance. Physicists believe that it comprises around a third of the “stuff” in the universe (whereas normal atoms, the things that you and I are made, of make up less than 5%), yet no one can tell you exactly what it is- and we’ve never seen it in a laboratory on Earth. Recently, a new paper appeared in the prestigious scientific journal Nature which claimed to have discovered a galaxy without any dark matter. 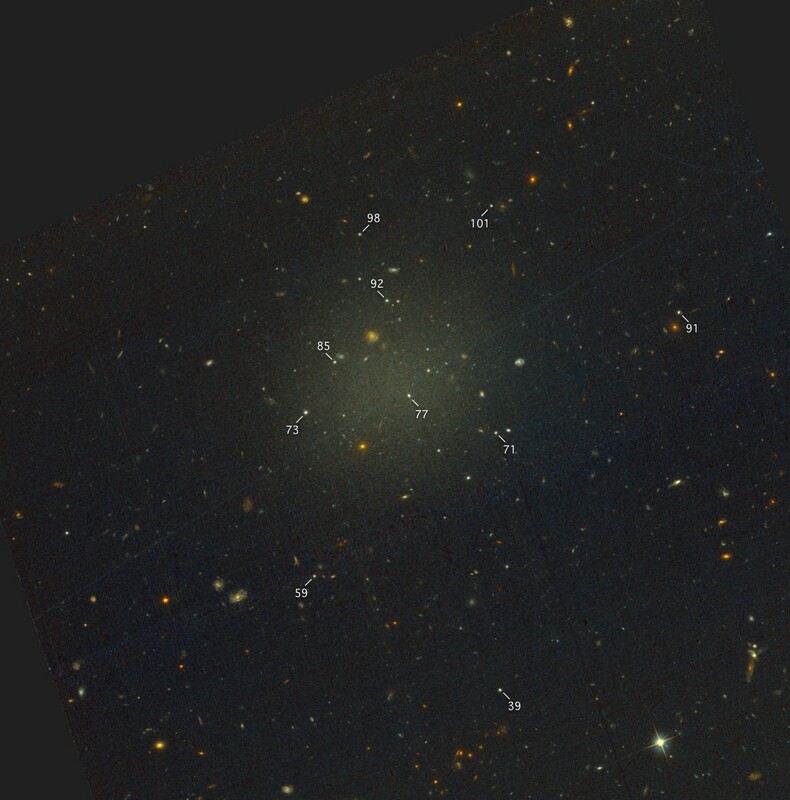 This would be a very interesting discovery, since up to now astronomers had thought that dark matter was ubiquitous wherever we find galaxies. Some scientists have come up with alternatives to dark matter, usually by writing down a theory where the force of gravity acts differently on very large (galaxy scale) distances. It’s possible to come up with a scenario where a single galaxy might lose its dark matter, but these alternative gravity theories must act the same way everywhere in the universe- so, slightly perversely, finding a galaxy without dark matter would go a long way to disproving many modified gravity theories and showing that dark matter actually does exist. The authors van Dokkum et. al (2018) discovered the galaxy they call NGC 1052–DF2, as shown in the image below. You can read their paper in Nature here (or an open-access version here). It’s known as an “ultra-diffuse galaxy”, since it’s about as big as the Milky Way but has around a thousand times fewer stars. This is what gives it its wispy appearance- compared to some more usual galaxies, it’s mostly empty space! The bright spots, labeled in the image, are most likely to be clusters of stars in the galaxy. The authors of the paper use spectroscopy to measure how quickly these star clusters are moving from our perspective. The spread of these measurements tells us the “velocity dispersion” of this galaxy, denoted by the Greek letter σ. Using some relatively simple Newtonian physics, you can go from a velocity dispersion to the mass within these clusters. van Dokkum et. al. 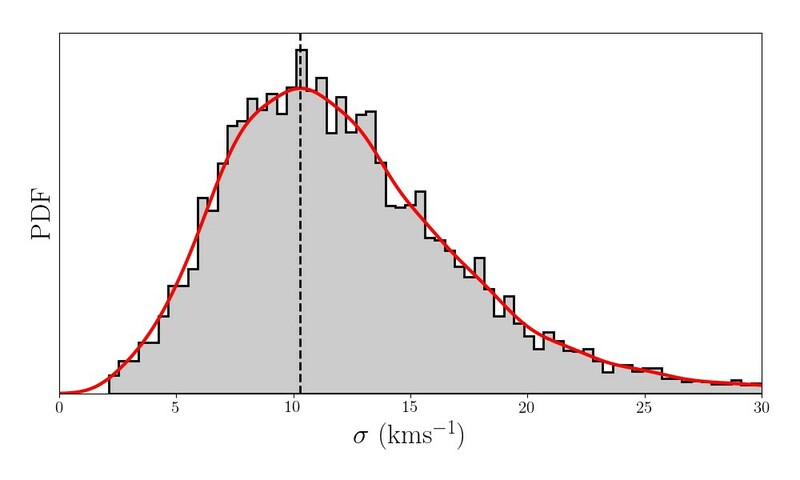 find the value of the velocity dispersion to be very low (3.2km/s, and less than 10.5 km/s with a 90% confidence), and the mass they infer can completely be accounted for by the stars they see- which is what leads them to their claim of this galaxy having no dark matter at all. The following work is inspired by this collection of tweets from astronomer Nicholas Martin and his student Nicholas Longeard. Spoiler alert: neither they nor I can reproduce the results van Dokkum et. al (2018) come to. I used the “Extended Data Figure 5” from the paper to get the velocity measurements and errors of each of the 10 star clusters (since they weren’t presented in a table). The analysis was conducted with python package pymc3 , and all code is available as an ipython notebook on my Github account here. Here’s a histogram of the data itself. We’re now trying to find the overall distribution that these data are drawn from, taking into account the uncertainties of their values. This is quite straightforward in pymc3, and leads to the probability distribution you can see below. The peak corresponds to the most likely value of σ. As you can see, I find that the most likely value of σ to be just over 10 km/s (10.3 +5.7/ -4.1 km/s), in contract to the authors who state that σ is less than 10.5 km/s with 90 confidence. 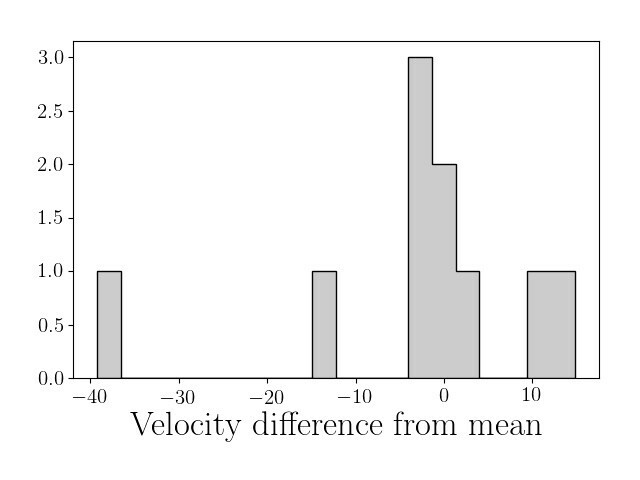 One of those data points looks like it’s quite far away from all the others, so maybe that’s biasing our analysis to larger spreads of velocity? One thing to note is that this data point also has a large error, so will automatically be down-weighted in the analysis I performed above. The simplest thing to do with this point would be to just throw it away, but we don’t have many data points to begin with! This would also be hard to justify from a scientific point of view, unless we had a good reason as to why this point was “bad” in some way. Let’s instead make our model more complicated, and allow for some of our clusters to be classed as “outliers” and excluded from the analysis. This approach closely follows that discussed in the excellent paper “Fitting a model to data”, by Hogg, Bovy & Lang (2010). I’ll now model our data as drawn from two distinct distributions: the “foreground” distribution we looked for before, and a separate “background” distribution which is unrelated to the first. 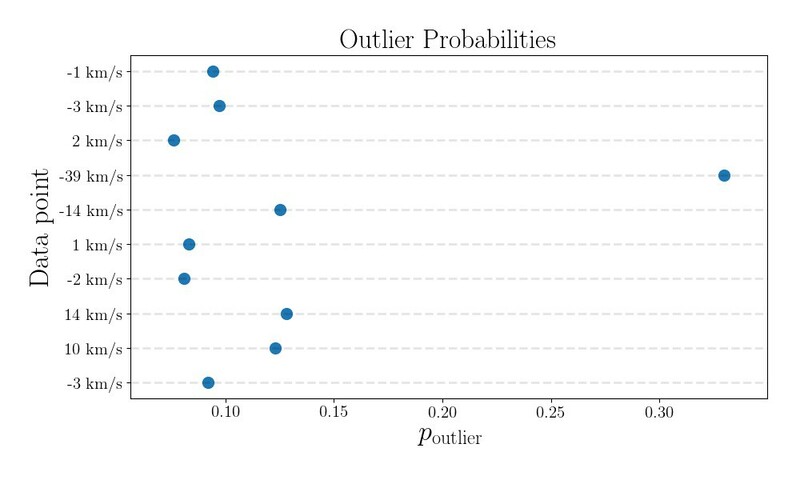 We assign each data point a probability that it’s drawn from the background “outlier” distribution, and then marginalise over these probabilities to downweight any of the points we think don’t belong. … and we now find a most-probable value of σ to be 8.7 +6.0/-4.2 km/s, still larger than the values quoted in van Dokkum et. al (2018). Following this analysis, I have my doubts about the conclusions presented in van Dokkum et. al (2018). 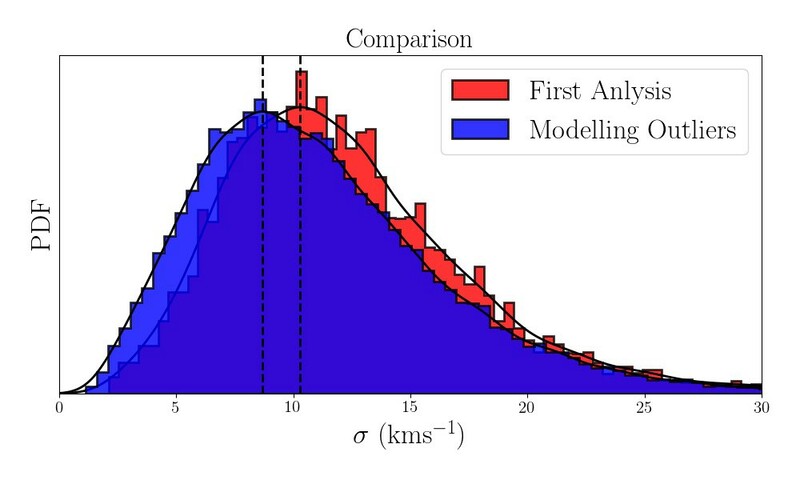 I haven’t yet looked into exactly why the analysis in the paper leads to such a small answer for σ, and until then I wouldn’t like to comment on who is definitively right or wrong here- but I do think that further work is needed before we can say conclusively that NGC 1052–DF2 is a galaxy without dark matter. It will be interesting to see how this picture changes if/when more measurements become available! I’m a PhD student at the University of Oxford, studying how nearby and distant galaxies change over their lifetimes. Interested in science, stats and coding.